Dig it! Here’s a new commissioned drawing of my beautiful English pals and all-around-lovely couple, Ruth Sneddon and Alex Noodle. Also pictured is their canine companion Kidd. Apparently, Pixar came out with a movie that has a passing resemblance to this image. I have never heard of it, but it seems to be up for an Oscar. Remember, like the Beatles, I am for sale. Want me to draw something for you? I’ll do it no matter how stupid the idea. The important thing here, is that you give me money. 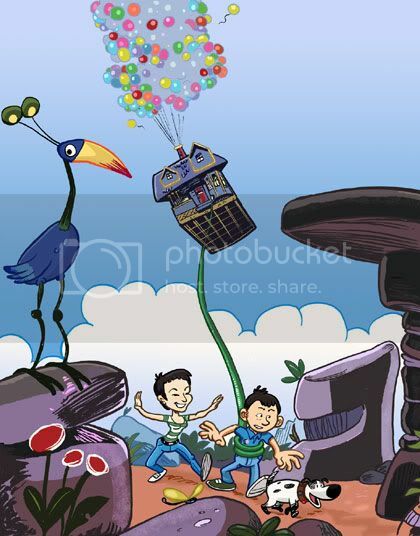 This entry was posted in illustration, joy of hack and tagged Disney, illustration, joy of hack, Pixar, UP on February 18, 2010 by Josh Latta. Man that is lovely. Great dog. Thanks! Please take note of the fancy colored outlines. I so rarely do that. It’s hard, that’s why.